Recruiters of HCL are now hiring a large number of candidates across India through HCL Off Campus 2019. So, those who are looking to get placed in HCL must and should apply online for the HCL Off Campus Drive 2019. The registration link, selection process, eligibility criteria are given below. Likely you have to know the details about HCL interview process. So, all 2018, 2019 Pass outs can hereby attend the HCL Off Campus 2019 Drive. If you are fit and interested to work with HCL team, then soon check this page and then apply for the HCL Careers. And now, they are hiring the candidates across India in Chennai, Maharastra, Hyderabad, Mumbai, Guwahati, Delhi, Noida, Cochin, Pune, etc. Aspirants who are willing to join the company are suggested to visit our website. So, know the latest information through this page. And who have the qualification as Any Graduates/ Post Graduates, BE, B.Tech, MBA, MCA, ME, M.Tech can also apply. We know that getting a job these days is a critical issue. Equally, the unemployment has been increasing day by day. Likewise, the aspirants should beat the competition by increasing their communication skills. And the candidates who want to crack a job should be good at arithmetic and logical skills as well as coding skills. Additionally, the HCL is now seeking for the talented aspirants all across India. Therefore, this a good opportunity for the aspirants to attain a job in the reputed MNC. Identically, if you are dynamic and talented, please don’t waste your skillset and go through this entire article for the details regarding HCL Off Campus 2019 Drive. The candidates can now get the current details about HCL Off Campus 2019 Drive through our website. Furthermore, the candidates who want to apply for HCL Off Campus 2019 should have the recommended skills and the eligibility criteria mentioned below. HCL (Hindustan Computers Limited) is an Indian Multinational IT Services Company headquartered in Noida, India. The technologies offered in HCL are IT Services, Business Process Outsourcing, Remote infrastructure, Research, and Development. It is among the topmost 20 trading companies in India. Furthermore, is it operating in the various sectors like government, industrial manufacturing, life sciences and healthcare, media and entertainment, aerospace and defense, automotive, consumer electronics, energy and utilities, financial services,mining and natural resources, public services, retail and consumer, semiconductor, server and storage, telecom and travel, transportation, logistics, and hospitality. In addition to this, HCL has the most dynamic atmosphere which helps the freshers to mold themselves and to attain success. At HCL Solutions you are not an ordinary employee you become an idea preneur and can give your ideas and solutions to solve the customer problems. You tend to maintain the relationship with work beyond the contract. In addition, this vibrant experience helps you to motivate ourselves coupled with our ideology and skillset. HCL Employees first value is the result of this empowerment of the employee. In the result, it helps to push each of us to the boundaries in whichever stream we are. Therefore, HCL TSS is now offering an elegant opportunity at your fingertips. And the candidates who are willing to apply for HCL Off Campus 2019 Drive. are requested to read our entire article. In brief, the candidates who are willing to apply for HCL Off Campus 2019 should meet the eligibility criteria. 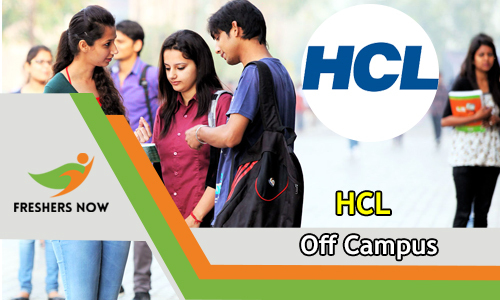 Aspirants need to check their eligibility in order to apply for HCL Off Campus. People who meet their eligibility criteria and sent further. To crack the interview in top MNC the candidate should have the following qualities. In order to get placed in HCL Off Campus 2019 Drive an individual have to meet the eligibility criteria and as well as the marks criteria given below. The students of B.E/BTech/MTech/MCA/MBA should have 60% in their 10th standard, Intermediate, Graduation and Post Graduation. In essence to this, the candidates who want to apply for this job need to clear their backlogs. You should not have any backlogs at the time of joining the company. Therefore the candidate who have cleared the eligibility criteria and the backlogs can now go the required skills we need to crack HCL Off Campus 2019 Drive. To know the required skills to crack the interview go through the following points. Have to know the minimum basic programming languages like C, C++, Java, My SQL, etc. In summary, the selection process is in the following manner. Therefore, the candidates who are willing to apply for this job needs to prepare for the written test which is purely based on arithmetic and logical reasoning skills. And the basic programming skills. Therefore, you can now bring the documents that are given below to attend the drive. To apply for HCL Off Campus 2019 who can now follow the step by step procedure given below. Go to the official site of HCL www.hcltech.com. Click on ” Register “. After registering you can now note down the reference id and password. You have to click on “Login“. Submit Your Resume and details required. In conclusion to this, if you don’t want to miss this great opportunity you can now register for HCL Off Campus 2019 Drive For Freshers | Online Registration and find your career growth. For more updates stay tuned to our website www.freshersnow.com.